Prohibition signs have the primary function of forbidding us to do something for various reasons. A fascinating aspect is the one of education. Those who put up a sign want to make you do or not do something, in the long run educate you to behave in a certain way. In this light, this is the start of a series of prohibition signs with deep cultural implications. Due to the different cultural backgrounds it will seem very funny to us, but it’s simply rooted in a different culture. 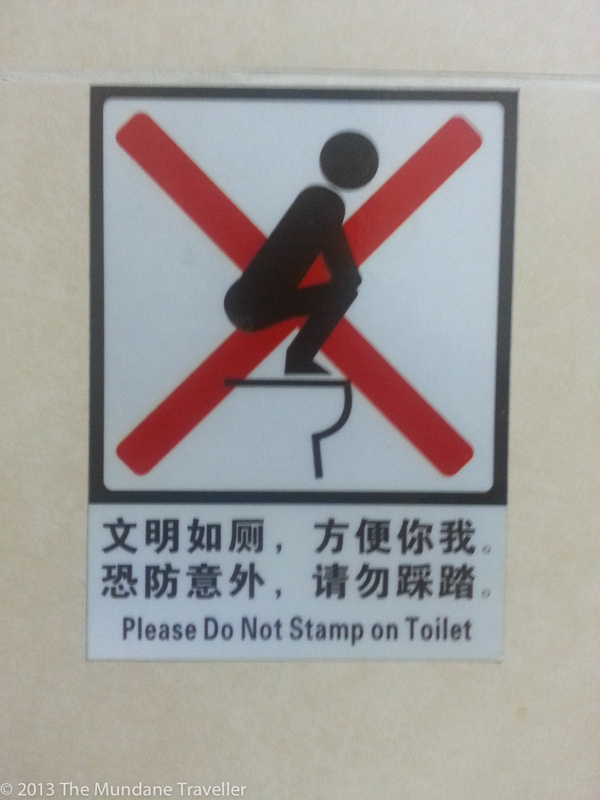 In this sign those who put up the sign want to avoid people standing on the seat of western toilets, so the next user does not find himself with a dirty seat and to educate people to sit on it instead of squatting. Many countries in this world have traditional squatting toilet, where you do not sit on a seat but squat down to relieve yourself. Those people are uncomfortable with sitting toilets or simply do not know what to do with a western toilet. One can even argue the squatting toilet is more hygienic but then it’s a matter of economic dominance that western toilets get more common than the squat down type. As a side note: “Please not stamp on toilet” is also a typical typo of a country with graphical representations of words, not phonetic ones like most western languages. For cultures with graphical representation “stamp” and “stand” is very close. That’s another source of humour I want to exploit in other postings.